Time keeps on flying..! It’s amazing how busy life can get and be, especially this time of year! Here’s stuff from the past couple of weeks! 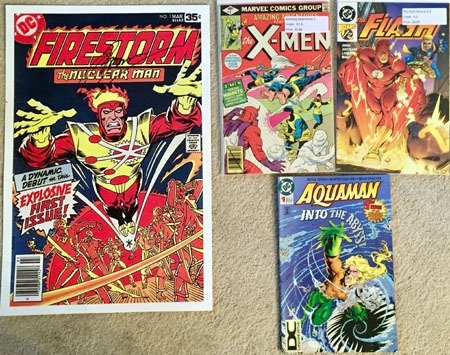 November 14 was an interesting week…with some unplanned purchases! Superman, Supergirl, and Mister Miracle were "givens." I am extremely disappointed at Dark Horse losing Buffy, Angel, and ESPECIALLY Firefly/Serenity to Boom! I refuse to buy anything from Boom thanks to their crap with Power Rangers #0, and sadly, that includes even Serenity. So I was all the MORE interested in "supporting" Dr. Horrible since it’s still from Dark Horse! 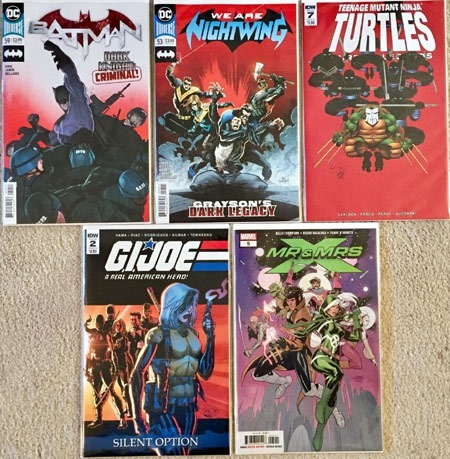 Sticking with GI Joe: A Real American Hero; this title progressing from #155 1/2 to #200 and on to #250 and now #257 without renumbering leaves me HOPE that IDW might ACTUALLY allow Teenage Mutant Ninja Turtles to go past #100! 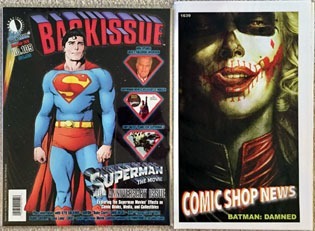 I’d been looking forward to–and thought I’d actually MISSED–this issue of Back Issue magazine. So it was a bit of a surprise, but seeing it, I grabbed it immediately! 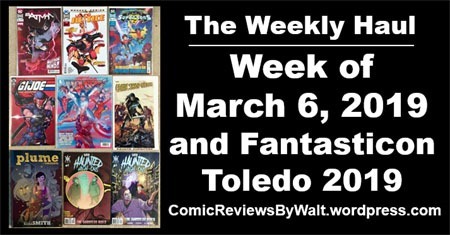 And of course, the usual Comic Shop News. 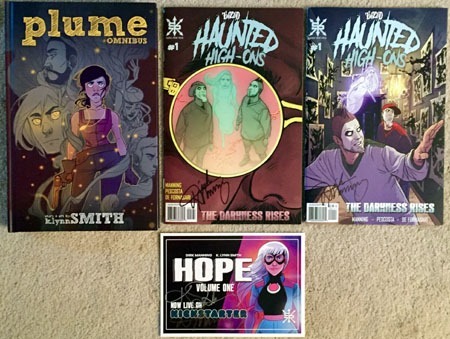 I’d backed Ursa Minor awhile back on Kickstarter due to Dirk Manning‘s involvement, and that issue came in! I had actually lost track of the time, so was (pleasantly) surprised when a mystery package arrived with my name on it! And speaking of: there was also Local Comic Shop Day where DC especially ticked me off with a limited-to-500-copies-only foiled The Green Lantern #1. Long commentary aside, it’s caused me to opt out of the series–I refuse now to buy #s 2-onward–in vote-with-my-wallet-for-real "protest" over the crappiness of the ultra-limited stock. (See also: 40 months I’ve refused to buy anything Valiant, and 34 months I’ve refused to buy anything Boom–I can’t bring myself to drop DC as a whole (particularly Batman and Superman/Action Comics) over The Green Lantern, but I can sure as heck drop THAT title! 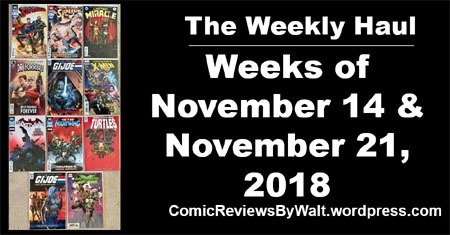 This past week was another HUGE week overall, thanks to Black Friday stuff added on to the usual…plus the Walmart comics! 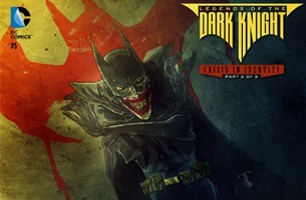 Here we have Batman #59, Nightwing #53, and TMNT: Urban Legends #7. 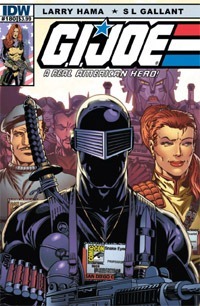 Then the spin-off GI Joe: A Real American Hero mini-series Silent Option #2. And the ONE Marvel title I’ll still buy–Mr. & Mrs. X, as I am a fan of Rogue and Gambit, so a title starring the two of them (married or otherwise) gets my money. 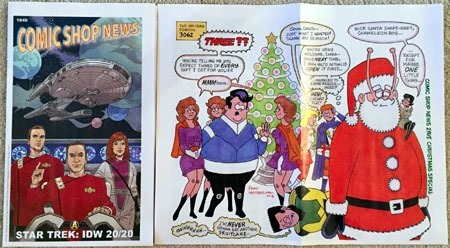 This week also had the Christmas extra issue with Comic Shop News. 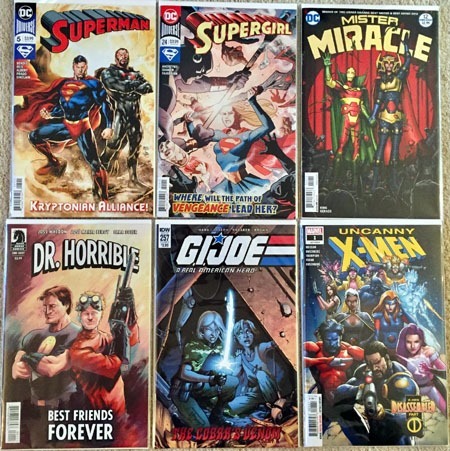 Finally, despite just getting the holiday issue a couple weeks earlier, ALL FOUR of the Walmart titles from DC hit at the same time. 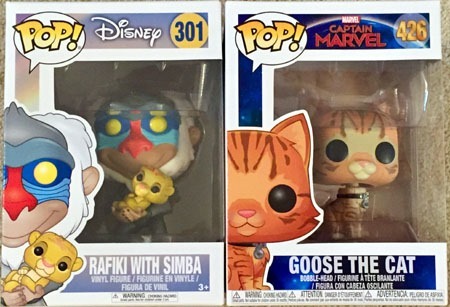 I was able to get these before Black Friday, so avoided whatever damages remaining issues wound up with from people checking them out in their poorly-placed area in the pop culture cards aisle by the self-checkouts. While I might detail more in a later post, Black Friday stuff saw a lot more expense than I’d intended going in, including TMNT toys; all 3 TPBs of the weekly Superman/Batman/Wonder Woman: Trinity series; Superman in the Sixties (completing my set of 40s/50s/60s/70s/80s); Keyforge stuff; several Hordes minis packs (Skorne); some DVD seasons; and some other stuff. I’m hoping the next couple weeks are rather light…though I suspect December will be rather screwy with Christmas and New Year timing for shipping…so we shall see! 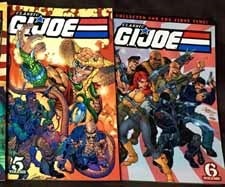 Back in 2001, a friend of mine had been talking to me about GI Joe–toys, comics, etc. And then more strikingly, and as has stuck with me for the last 15 years or so–I remember his commenting on the release date of a new comic series: Devil’s Due published their then-new GI Joe comic on September 12th, 2001. One day after 9/11. Several years later, he and I went to a signing at his local shop with Michael Turner. Along with the an Identity Crisis issue, poster, and something else…I bought the Marvel GI Joe vol. 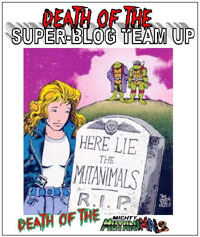 1 paperback, reprinting the first 10 issues of that original series. I never did get the rest of that 5-volume series, that had reprinted just under 1/3 of the core/main ongoing series. 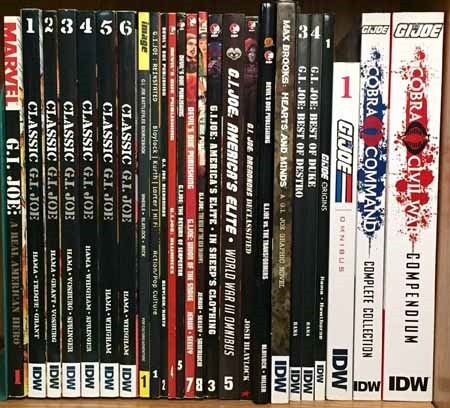 Skip ahead a few years to IDW…they got the new license, and apparently the rights to any/all prior-published GI Joe comics (Marvel and Devil’s Due), so they followed the Marvel format and reprinted the classic series in 10-issue volumes. Somewhere along the way, I wound up with the IDW edition of the first volume, and then the second. (I keep that original Marvel one for the sentimental value, but have a definite desire to get the entirety of the run of the classic volumes.) The Classic GI Joe run is all the more appealing to me as I recently discovered that IDW is (wisely and awesomely, I might add!) 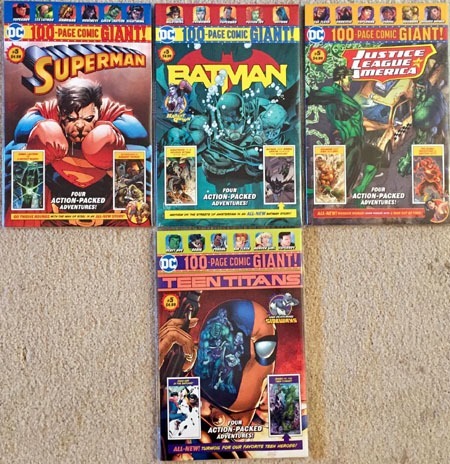 re-collecting their own GI Joe: A Real American Hero run into subsequently-numbered volumes. 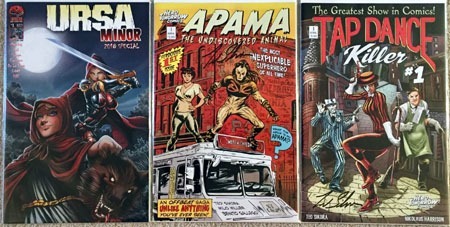 The ARAH series had a "zero issue" as a Free Comic Book Day #155 1/2 a number of years ago, and then picked up with the original Marvel numbering at #156 and continues (I believe) to this day, somewhere in the #220s. 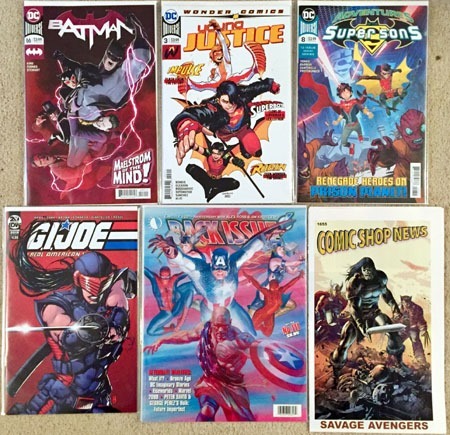 The other day, despite being a lot tighter with my finances lately, I found a number of the IDW Classic GI Joe volumes and snagged them–I know I intend to get them, and when else am I going to find a bunch at the same place/same time for 50% off? While they had 5 volumes (3-7) I noticed a nasty tear in the outer spine of the 7th volume that would be glaringly obvious (to me, at least) on the shelf, not reasonably repairable, and certainly not at all worth my time/hassle for the higher price (seems the first 6 volumes were $19.99 before jumping to $24.99 for 7+). 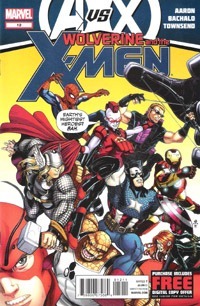 Still, already having the first two, even "only" getting the four volumes at half-off cover (surprisingly, as I honestly do not know if these–or these specific printings–are still considered "in print" or not) made for a fantastic deal, especially balanced against the notion that each volume has 10 issues, and 10 contemporary Marvel comics would be what I paid for 40 issues’ content across these four volumes. Unfortunately, I discovered a bit of a surprise Sunday night when I went to peel the price stickers off. 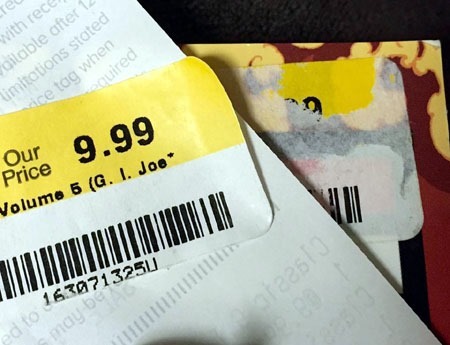 Usually, Half-Price Books has these stickers that–like many bookstores–adhere reliably to the book covers…but unlike cheapo retail/grocery store price tags, the bookstores’ tags are generally of some material/stickiness that can be peeled off easily, simply, and cleanly, leaving no residue, stickiness or other damage/marking behind. 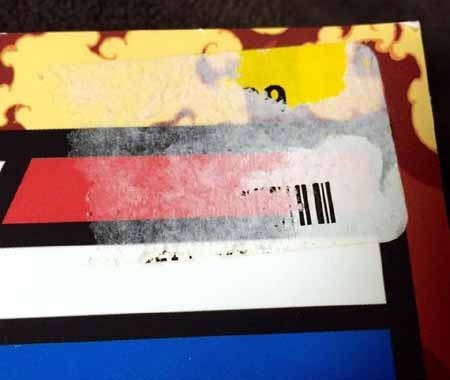 However, under the "new" HPB stickers, I found horrible residue from what seems to be an older HPB sticker. At first glance, I thought maybe (just maybe) I had done a bad peel, ripping it off way faster than necessary. But no, examining what was left behind, it most definitely was not from the sticker that I myself had peeled off. My primary peeve, personally, in this case is that the bad-sticker stuff was COVERED UP. I had no clue of it until after I got the books home–it’s NOT like I peel price stickers off a book AT THE STORE or anything. Buying used, or second-hand, or whatever–I have a much higher tolerance for condition of the book…but it tends to greatly bother me on pricing. If "expected price" is 1/2-off cover price and most stuff is in pretty good condition…when something is noticeably damaged, I’d be inclined to think that justifies a modified-downward price…such as on what they seem to deem as so worthy of being "collectible materials." If it’s so "collectible" and they’re such experts to deal in wildly-varied values of stuff, surely they should also attend to issues like huge patches of shredded/leftover stickers/sticker residue. That said, while I am highly frustrated at the scraping I had to do to "mostly" remove the residue…I’m still very glad I was able to get these 4 books for half-cover-price each, making them extremely reasonably priced…and bringing me up to about the 1/3 mark for having the entire series of Classic GI Joe. Above: including this purchase, my "GI Joe Library." Along with my specific complaints about the GI Joe volumes…the Half-Price Books location I found them at was one I haven’t been to in about 6 months, so I was quite shocked when I checked their "regular comics" section out of curiosity, given the two locations closer to where I live have the "all are $1 unless marked" and "all are now 25 (50? I can’t remember) cents unless marked." 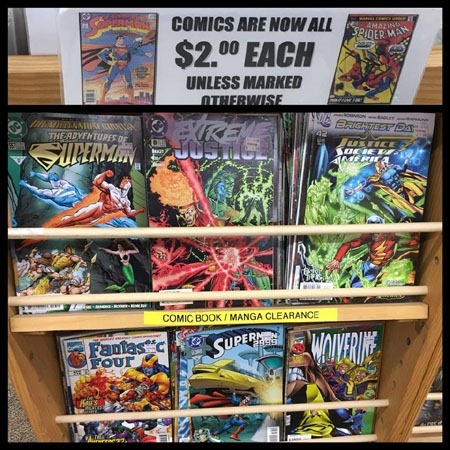 This one has them as $2 unless marked–and with marked prices generally being at least $2 if not more (with $10, $15, $25 marked, and some color photocopies/printouts put as proxies in the bins with the actual issues held behind the counter for $25+ issues). The issues that would be $2? Mainly stuff that I would deem–at best–$1 bin fodder at an actual comic shop. Meanwhile, checking for some joy in the "clearance" endcap yielded its own shock: clearance comics were all price-stickered as $1.00! To say that I was appalled would be an understatement…so much so that I tweeted out the above photo with my frustration the other day! But getting into all this has led me to what is likely the topic for an entire post on its own. 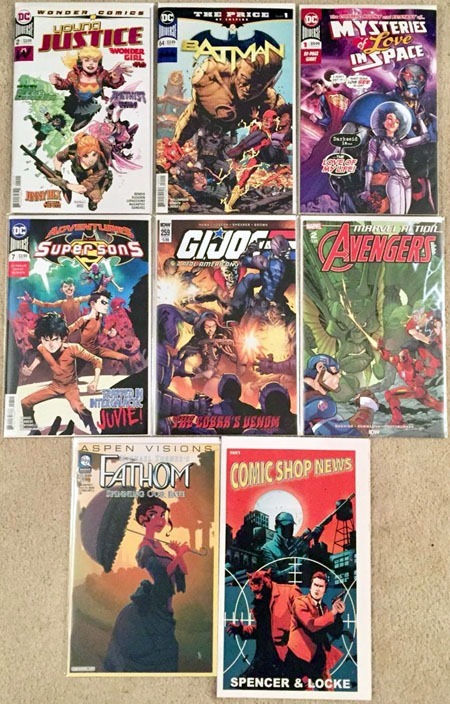 The Rest of the Stack is my general mini-review coverage of new comics for any given week. It’s in addition to (or in place of) full-size individual reviews. 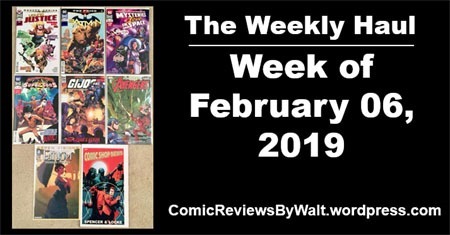 It’s far less formal, and more off-the-top-of-my head thoughts on the given comics than it is detailed reviews. This issue wraps up the Snake-Eyes Declassified story, detailing in six issues the true "origin" of the man known to us only as Snake-Eyes. This issue takes us into Snake-Eyes’ earliest days with the G.I. 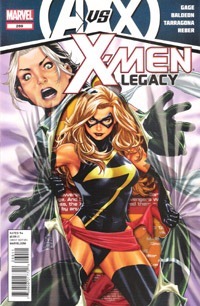 Joe team, and details the mission that largely shaped the character, particularly as he was first seen in the original Marvel series, way back in # 1. 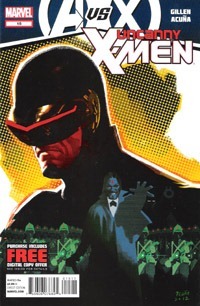 As a reader who’s not terribly familiar with the character, I can say only that I enjoyed this issue, and that it seems to have certain elements I was aware of from flashbacks. 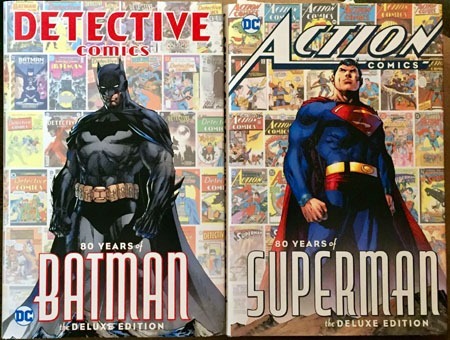 Discussing the issue with a friend, it seems that not only this issue, but throughout the series, there have been scenes taken directly from those earliest issues, and given that, lends even more credibility/authenticity to this story. After trauma in/surrounding his service to his country, Snake-Eyes has been through a lot, and has ultimately wound up on a "daring, highly-trained special mission force" where he can put his experience/training/abilities to good use. 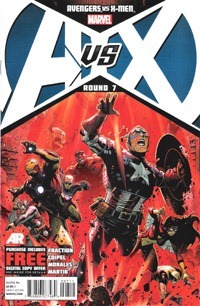 The Joes are sent on a rescue mission, but a mechanical failure with a helicopter leads to disaster, and in the midst of the disaster, several key things occur that close the gap between previous issues of this mini and the first issue of the Marvel series. The art works very well here, conveying exactly what needs to be gotten across to the reader, including something as simple and subtle as the shifting of eyes in a 3-panel sequence at the beginning. In the end, this story works very well as a story in and of itself–of a man’s trauma and the things he goes through as he deals with loss and hurt–but it also places into a single coherent chronicle the backstory to what is arguably one of (if not the) most popular characters of the G.I. Joe saga. Though a "#6 of 6" is not necessarily the best jumping-on point, if you’ve followed this series thus far, I highly recommend getting this final issue. And if you’ve passe don the series–do consider checking out the TPB when it (inevitably) comes out.